For girls of all ages, “COLOR ME POWERFUL” is a means to access your already-wise self. There is nothing outside of yourself that can make you more powerful than you already are right now. It’s just that you don’t believe it. Belief is a powerful thing. If you are not convinced you have a great store of inherent strength within you, no matter how many weapons you might amass, you will still feel vulnerable. This is true for everyone. The transformative key to finding power within yourself is to change your relationship to power. The pages within this book provide a sampling of different maidens in the act of standing, or sitting, in their power. By no means is this all there is. Although they can be sorted into basic archetypal categories, feminine expressions of power are as unique as each woman. As I come from a Fantasy Art background, my work tends to be a hopeful flavor between medieval, romantic and mythic. Whenever I approach a piece of art with reverence, it becomes sacred in the making. I consciously tap into the deep wisdom of whatever I’m depicting. As I tune into the energies, I create a visual meditation. The resulting image contains the footprints of what has been my divine experience. 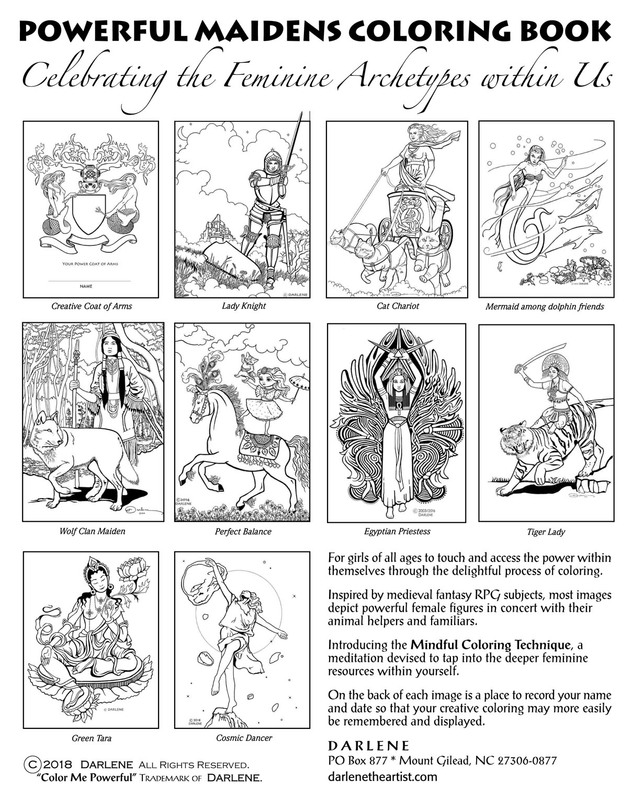 Therefore, residual energy resides within the art of all the pages contained within this coloring book. It’s very possible to personally retrieve the spiritual essence associated with any specific image. The meaning behind the dance — between spirit, creativity, intuition, and inspiration — is there for those who seek it. This happens naturally when you are ready to access a part of yourself new to you. 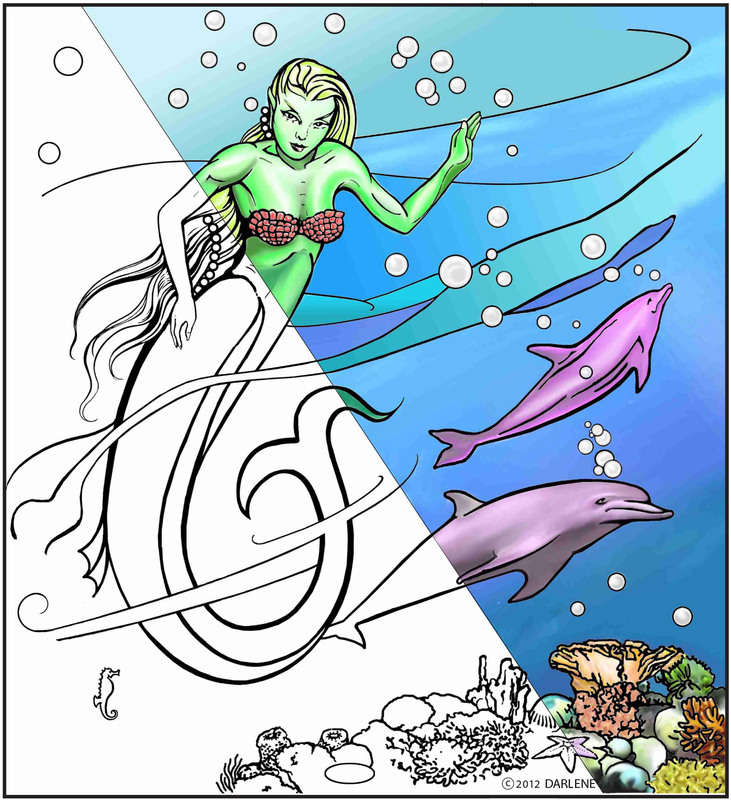 The Powerful Maidens “COLOR ME POWERFUL” coloring book consists of 11 positive and inspiring images of feminine empowerment. For little girls, the images serve to awaken and inspire their intuition and imagination. Bigger girls can choose to go deeper with the images. The images represent a doorway, a means by which anyone can tap into deeper resources within themselves. Whether or not you choose to do the Mindful Coloring Technique, you are interacting with beauty. It’s a metaphor. Through the act of coloring, you are consciously adding color to the beauty within yourself. You are becoming reacquainted with the joy of your hidden potential—as a confident, competent, desirable, beautiful maiden, who is capable of so many hidden miracles.